One of the reasons I love traveling in Europe is because there is stuff to be seen that people built five hundred or a thousand years ago. In the USA, there’s nothing that old. 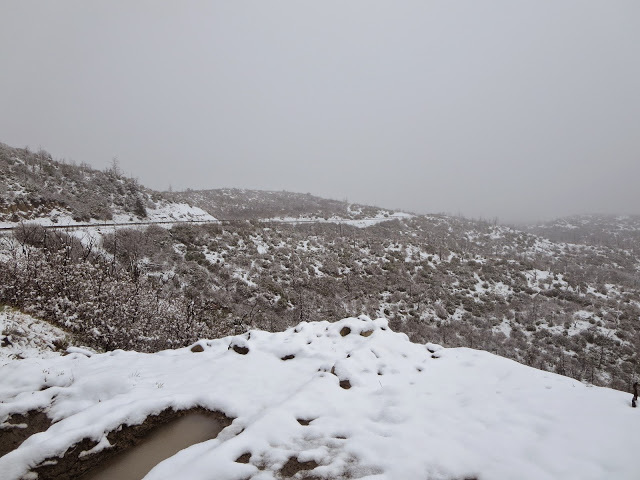 It was so nasty this morning, cold and rainy, that I considered not trying to drive the 35 miles from Durango to the entrance to Mesa Verde National Park, not to mention driving and hiking through the park. Once you enter the park, there’s an hour drive to the archaeological sites, and the first part of the drive goes up over 8,000 feet, and it was snowing and foggy and all these beautiful views weren’t there. I started to get pretty bummed out. But as I approached the sites, the weather improved (snow became rain), and over the course of the day it improved some more, with sun breaks between showers. And then seeing the first cliff dwellings brought tears to my eyes. Cliff Palace. There’d normally be people scrambling all over the ruins, but it is closed for restoration, which is good for picture taking. 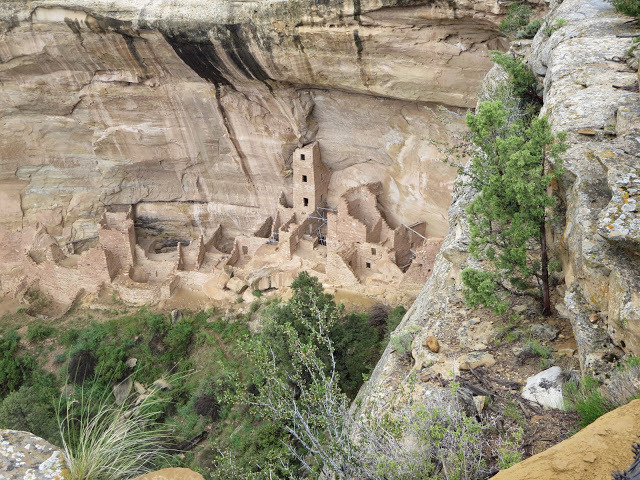 Over the course of the day I saw cliff dwellings dating from the 11th to 13th centuries, and older mesa structures going back another 300 — 400 years. And I visited two dwellings, Balcony House (via guided ranger tour) and Spruce Tree House (via self‐guided tour). I was especially enamored of Square Tower House, which includes the tallest structure in any of the dwellings. 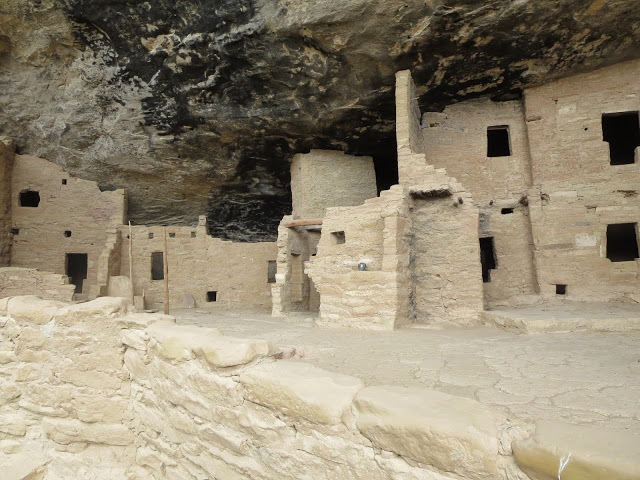 The period when all these cliff dwellings were built was the late 12th century until the late 13th. 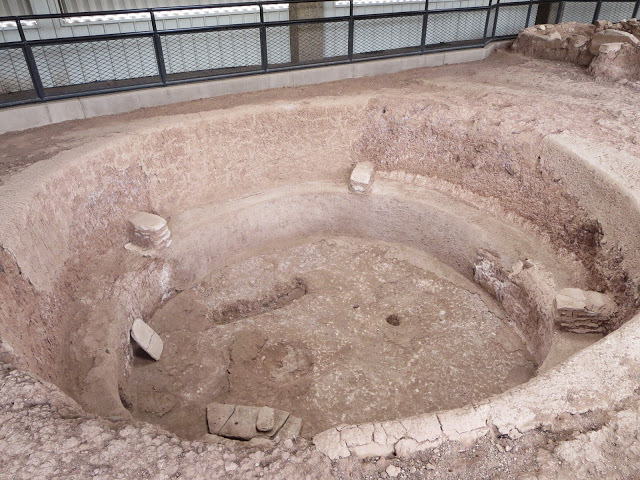 By about 1300, a period of severe drought led these people (the ancestors of the modern Pueblo people) to migrate elsewhere, such as the area of northern New Mexico where I visited Taos Pueblo yesterday and passed a number of other Pueblos between Santa Fe and Taos. There were two driving loops, one on the top of the mesa and one along the rim of the canyon. The mesa top was probably less impressive, but it really provided a context for seeing the cliff dwellings. Unfortunately, I had to do them in the opposite order, because I had a ticket for the 11:00 tour to Balcony House. 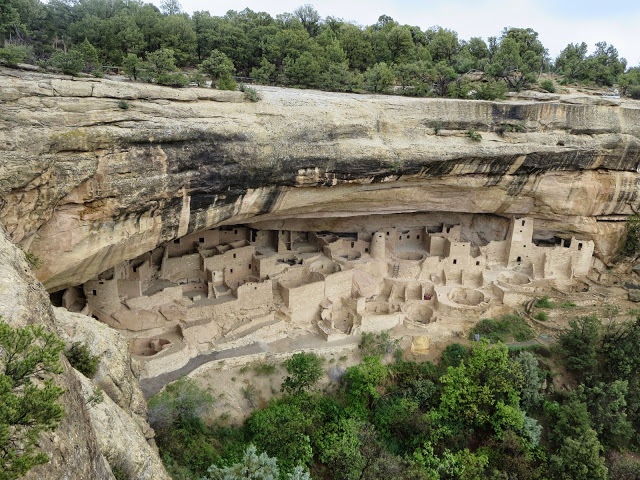 Nevertheless, it was fascinating to see how the earlier dwellings on the mesa top, from as early as the 8th century, used much cruder building methods, and how gradually more advanced technologies were used, leading to the ability to create multi‐story dwellings. 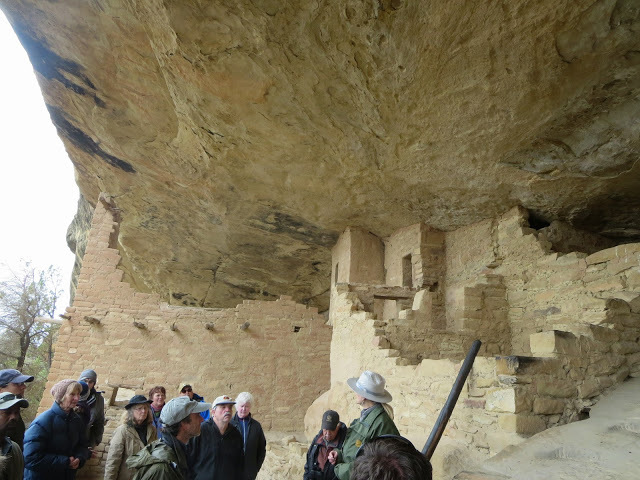 Ranger Jan shared a really interesting story about the construction of the kivas. Kiva at Sun Point Pueblo, on the mesa top. The people moved from here to the cliff dwellings around 1200. 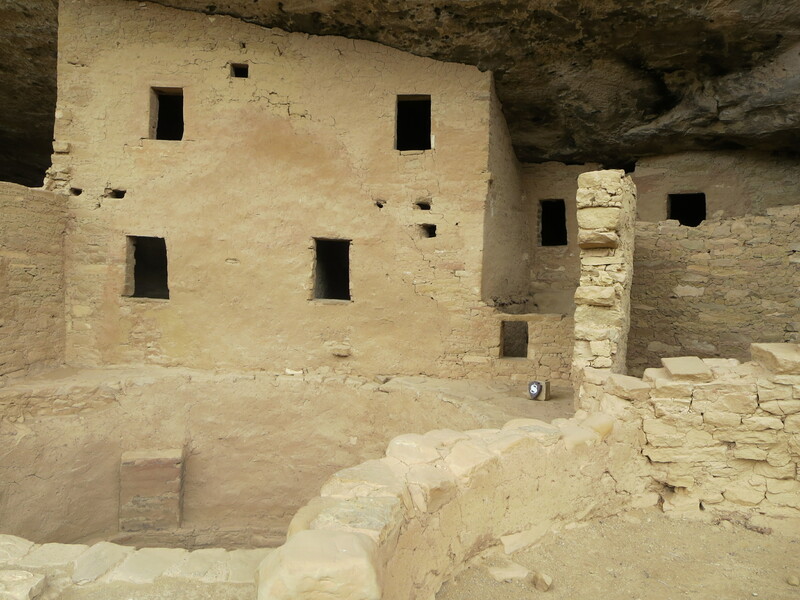 Ranger Jan also told us that the Pueblo people say these dwellings are not deserted — their ancestors live there. Great pics, bring back good old memories.